O the depth of the riches both of the wisdom and knowledge of God! How unsearchable are his judgments, and his ways past finding out. We come to the Lord Jesus for salvation, when we are born from above. 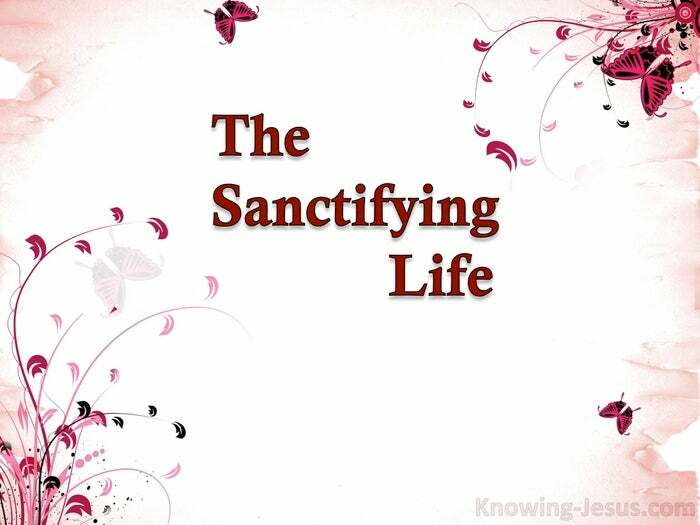 We live in the Lord Jesus for sanctification, throughout our Christian life. We come to the Lord Jesus as a sinner and receive salvation (of the spirit). We live in Christ as a saint, for the sanctification of the soul. Through salvation (of the spirit) we become related to God as His children. Through sanctification (of the soul) He becomes related to us in His Son. Salvation of the spirit (or being born again) takes one moment in time. Salvation of the soul (or sanctification) takes the complete life-span of a believer. Salvation of the body (or glorification) takes effect after death, (or at the rapture) and the apostle Paul outlines in logical and perfect detail this triplet of experience. When we are born again we become the children of God. Through sanctification we are matured through trials into being sons of God. At glorification we will be perfected, and the apostle Paul in his epistles outlines in logical sequence this triad of salvation. Christians are children now but the adoption of sons takes place later, for we know that: the whole creation groans, with birth pangs together until now, and not only that, but we also who have the first-fruits of the Spirit, even we ourselves groan in ourselves, eagerly waiting for the adoption – the redemption of our body. Rom.8:19. Israel as a nation is already an adopted son (waiting for forgiveness of the spirit.) The Church is already forgiven (waiting for our adoption as sons.) O the depth of the riches both of the wisdom and knowledge of God! The process of sanctification should be the most vital consideration to us all, but many Christians remain babes, ingesting only the milk of the Word. Some begin the sanctification process and pull back, when the going gets tough. Others prefer the trinkets of this life to the treasures that are stored up in heaven and many can’t comprehend that faith comes to the church by hearing not by sight – unlike Israel for whom signs were designed, so they could recognise their Messiah. Yes, Many can’t comprehend that sanctifying faith comes by hearing not sight – thinking that spiritual maturity comes thru experiences, signs, wonders, miracles or feelings! But sanctification is simply being in Christ… that’s it.. and remaining in Him. As Christ prepared to leave those He loved He left them with a simple message: I am the vine and you are the branches – remain in Me and I in you John 15:5. The vine is Christ. The root is Christ. The stem is Christ and we are grafted into Him. You and I are branches in the Vine. We are nothing but dead sticks without His life. We are to remain in Him; covered by Him; living on Him; connected to Him – corrected by Him.We are to think like Him; to love as He loved; to bear fruit through Him – for apart from Him we are nothing and that is zero! Being saved is one thing, but being sanctified in quite another – but both rest on choice. Salvation is open to all sinners but only those choosing to believe in Him are saved. Sanctification and maturing in the Christian life is open to all believers and all believers will eventually be sanctified, for we shall all be like Him – but that happens after we leave this earth. The choice for the believer is willing sanctification or unwilling sanctification. Willing sanctification is a life-process now, where we willingly submit to Him.. to remain in Him; covered by Him; living on Him; connected to Him – corrected by Him. Thinking like Him; loving as He loved and bearing fruit through Him. Willing sanctification is what the Lord seeks and performs through child training. Choosing the sanctifying process means trusting Him when you don’t understand, for it is the faithful servant that enters willingly into the sanctification process. 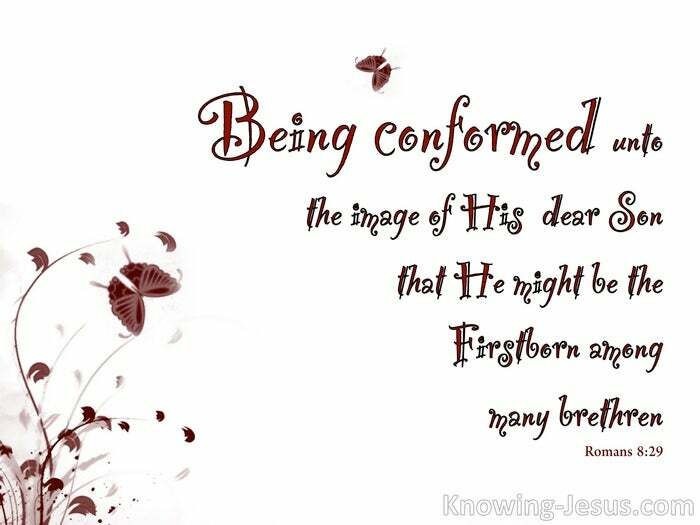 And sometimes He will take us to the extremity of hope to test our faith in Him, for sanctification is: “being conformed into the image and likeness of Christ“. And for years I have made it my daily prayer to ask the Lord to search out every nook and cranny of my life, that’s displeasing to Him.. to do whatever it takes to conform me into His likeness.. to do whatever it takes to conform my soul-life to His Christ-life – to make me willing to change into the person He wants me to be. To align my mind to the mind of Christ and to align my will to the will of God – to break me if necessary and to humble me if required – and I pray this not just for myself – but for those that I love. For nothing is more important than willingly being changed into Christ’s likeness.